I took a connecting flight to save $50. My flight into SFO is delayed 3 hours. I am on my 2nd $10 Guinness with 2 hours to go. Do the math. The astute reader(s) will need more information to determine if this venture will be a net gain or loss. What was your original departure time? I believe you have all the information you need. How much did the airport ITalian BeeF cost and do I figure that in the equation ? I ask, becuase I know you could never, ever, drink 5 pints of Guinness. Alright. Final accounting. 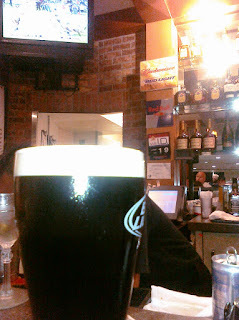 SFO cleared the flight to takeoff from SD, so we were only 90 minutes delayed, and I only had the two pints. The Italian Beef at Midway consumed after Sigrid took off should count ($7). The crappy Pizza Uno pepperoni pizza consumed at the San Diego airport during the delay should count ($10). The vodka & tonic on the SD-SF flight should count ($5). The BART fare ($8) and cab ride from Embarcadero ($7) to get home at midnight should count, as I otherwise would have shared a cab with Sigrid. Net net - total incremental costs $57 - $50 = $7. So I paid $7 for the privilege of extending the trip home by 4-5 hours and enjoying the discomfort and inconvenience of adding an addtional airport to the ride. Well, at least you're helping out the economy. well put - Sean. IF only more people would personally take on economic stimulus.